Chaitanya Charan Dasa - April 27 - May 1 ~ The Toronto Hare Krishna Temple! The Toronto Hare Krishna Temple will be welcoming Chaitanya Charan Dasa from April 27 to May 1, 2017. Chaitanya Charan is a monk and spiritual author. He has done his Electronics & Telecommunications Engineering from the Government College of Engineering, Pune. He subsequently served as a software engineer in a prominent multinational software corporation. 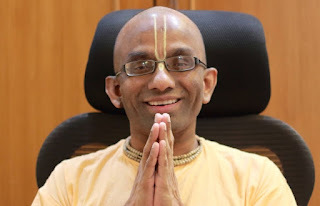 Seeing the prevalent problems of stress, depression, addiction and overall misdirection – all caused by a lack of spirituality – he felt inspired to dedicate his life to the cause of sharing the spiritual wisdom of the Bhagavad-gita under the aegis of ISKCON (International Society for Krishna consciousness). He is a member of ISKCON’s leading intellectual body, the Shastric Advisory Council, and is the associate-editor of ISKCON’s global magazine, Back to Godhead. He is the author of the world’s only Gita-daily feature, wherein he writes daily a 300-word inspirational reflection on a verse from the Bhagavad- Gita. He has written over seventeen hundred Gita meditations that are posted on www.gitadaily.com and are read through daily feeds by thousands from all over the world. He also answers questions by seekers on his site www.thespiritualscientist.com, where his over three thousand five hundred audio answers and several hundred articles are available. He travels all over the world from Australia to America, giving talks on spiritual subjects in temples, universities and companies. His articles have been published in many national newspapers including Indian Express, Economic Times and Times of India in the Speaking Tree column. His writings in English have been translated into several foreign languages including German, Chinese and Romanian and several Indian languages including Kannada, Telgu, Bengali, Hindi and Marathi. He is the author of sixteen books.